T17 is a Science Platform. Normally used for Science Missions, Deep Photometry, Narrowband and 'Extended Red' light IR imaging. It is equipped with a FLI ProLine E2V CCD47-10-1-109 CCD. that has 'extended red sensitivity' when compared to standard CCD’s. Giving it an almost 'Near Infrared' mission profile. T17 is a unique telescope. T17 holds multiple world record achievements for the most distant objects imaged by amateur astronomers. T17 can detect extremely distant galaxies in 300 sec exposures. Some of its targets have been the most distant and oldest ever imaged on a publicly accessible telescope. If you wanted to bring out stars hidden in nebula with its Helium filter or chase targets that are very faint, then this CCD will do the job. Its extremely sensitive, so much so that OVER exposure becomes an issue and users should take care since its CCD is of the NABG variety. 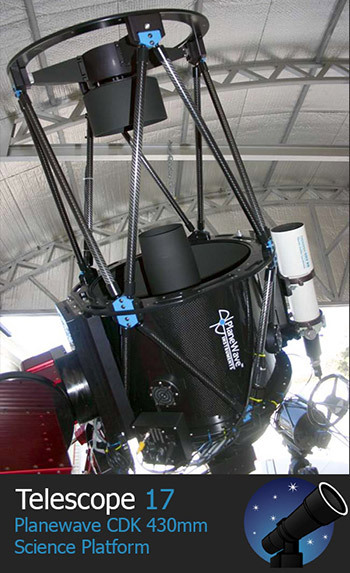 T17 is a valuable science asset to iTelescope Siding Spring Observatory.